Download five OO words phonics worksheets for your kids to practice while writing three times each. Choose whether you want to print the large line spacing (K123 - 9 words) or the small line spacing (456 - 12 words). 3. OO as in door and floor. The first two worksheets show the first sound, the third combines the words for the first and second sounds. The last two focus on the second sound and the last page has space to practice your own OO phonics words. See OO phonics words with example dictation sentences below. 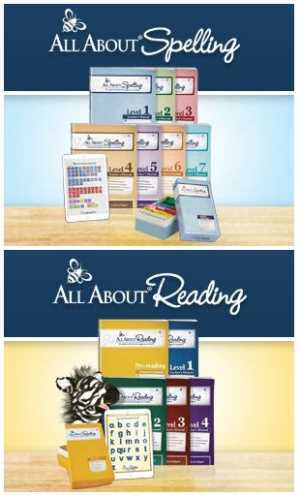 Buy 190+ worksheets and alphabet flash cards. Model sounds with dictation. Kids practice saying and writing phonograms, blends, digraphs. The main sound that a phonogram makes is called its first sound. The first sound of /oo/ is OO as in moon. The unwritten phonics rule is that we usually use the first sound. The digraph OO as in moon sounds very much like the /u/ for ESL learners. It's the main way we say this sound, so these make good elementary ESL phonics worksheets. English words containing OO usually use a CVVC pattern, meaning that there are one or more consonants on either end of the phonogram in a one syllable word. There are no blends or silent letters as OO says only one sound. 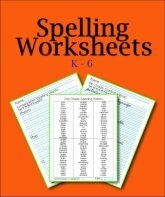 K123 OO phonics words Large Font Worksheets: K-2, print 2-up for high school. 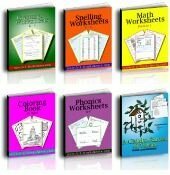 Third Grade size OO phonics words Small Font Worksheets: Grades 3-6+. Choose the sizes that work for your children. 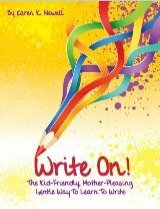 It's handy to have the different sizes to teach phonics to several ages of children to use as handwriting worksheets. As you're teaching the phonogram OO, say the word and have your children repeat while they write the words on paper or the board. The main thing is to have practice writing the /oo/ sound while saying OO. The oo worksheets are helpful for practicing the day's lesson. See simple sentences below that you can use to teach the vocabulary of the words. bloom – The cherry tree will bloom in spring. boot – Bob lost his left cowboy boot. cool – The cool breeze was nice. coop – Put the chicken in her coop. drool – Baby will drool when she smells lunch. food – Mom put the food on the shelf. fool – You can not fool Sam. goose – The goose, the gander, and the goslings are noisy. hoot – Owls hoot at night. loose – Latch the loose gate before the storm. moon – The full moon is bright. noon – The sun is overhead at noon. moose – Dan saw a moose in Canada. poor – Poor Tim did not see it. roof – Paint the roof green. root – The tree root broke the sidewalk. shoot – In spring a new shoot will become a leaf. soon – School is out soon. spoon – Put a spoon by the dish. stoop – Stoop to put the flowers on the bottom step of the stoop. school – We start school in the fall. tool – A hammer is a tool. toot – Toot the horn when you see a deer. tootle – Tootle is a little toot. tooth – Tom lost a tooth. troop – The army troop marched west. zoo – I saw a kangaroo at the zoo. Good was my favorite word to write in cursive handwriting. It was fun to make and loop the letters together. book – Tootle is a good book. brook – Scruffy liked floating down the brook. cook – Mom will cook cookies. crook – A crook in the road turns left or right. foot – This is my right foot. good – Dad said good night. hood – Pull up your hood when it rains. hoof – The horse checked the path with his hoof. hook – Hang your hoodie on the hook. look – Look at the pretty bird in the tree. nook - I love to read my book in my book nook. soot – There was soot in the chimney. stood – She plays in the lawn. took – He took the book home. wool – She lined the box with soft wool. wood – Put the sticks in the wood box. door – Door rhymes with more and store. floor – Floor sounds like door. blood – Blood rhymes with mud. flood – Flood sounds like blood. Simply add prefixes and suffixes to the words above to make hundreds of two and three syllable words containing OO while practicing the same root word for spelling. Many times we make a word from what animals say like woof and moo or what things say as owls and the wind say woo. We also make up diminutives that end in OO like foo-foo (fancy nothings), choo-choo (for a train), oodles (meaning many, many items), and boo-boo for a small injury. Surprise and delight are often expressed by saying "oo". boo – Peek a boo! choo-choo – The choo-choo train says woo, woo. coo – The pigeon sounded like a baby when it said coo. igloo – The Eskimo lives in an igloo in cold north lands. kangaroo – I saw a kangaroo at the zoo. moo – The cow in the farm yard said moo. shampoo – Ann uses baby shampoo in her hair. woo – The owl sounded like the wind when it said woo. too – I heard the sound too. zoo – A zoo is a park where you can see animals. Words that begin with OO are easy to find in a dictionary. oodles – I like oodles and oodles of noodles! oolong – Oolong tea is good with lunch. ooze – Sweet honey oozed from the warm honey comb. Other OO words that have OO at the beginning of the word are scientific words relating to the study of eggs which is the Greek base word: oology, oologist, oophyte, oospore. Print these PDF phonics activities or store them in a file for your child's phonics lessons and exercises. Whether they are reading the lists, writing the words, or typing the words, they'll have excellent phonics practice. 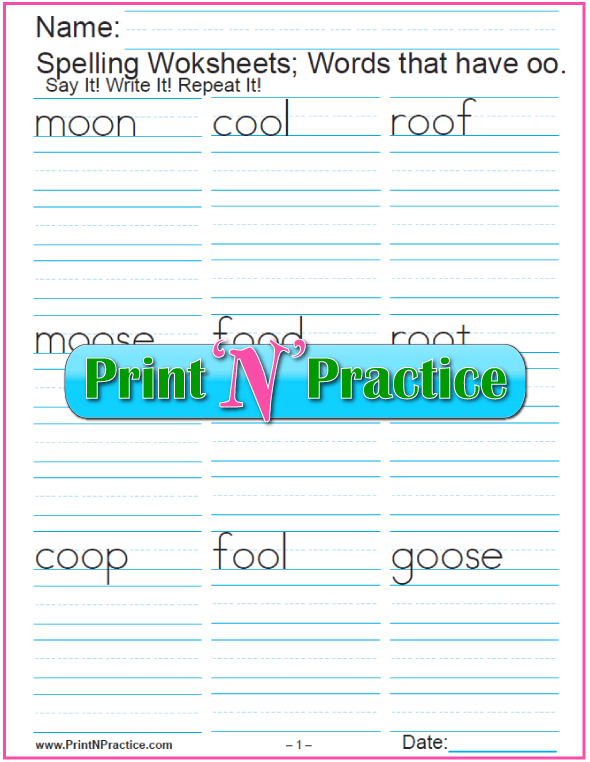 Learn how PrintNPractice PDFs are printable interactive worksheets here. 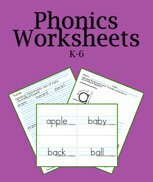 You'll find more than forty kindergarten, first grade, second grade, and third grade phonics worksheets, phonics books, activities, and videos on our main phonics page. 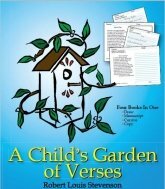 A Child's Garden of Verses - Poetry and handwriting printable worksheets. Thank you for sharing with your favorite teachers, parents, and homeschool families! Buy the whole collection of our phonics worksheets in one download. This way you have easy access to helping your students excel in necessary reading skills and you can work offline. Homeschool worksheets and phonics practice at their best. Great ESL printable worksheets! 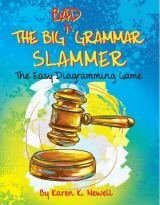 Spalding Phonics or Schola phonics books?